On Fridays, kids often watch the clock in eager anticipation of the end of the school week. This was not the case at Franklin L. Williams Middle School in Jersey City last Friday. John Flora’s Little Kids Rock students instead waited zealously for two famous bassists to arrive and rock their worlds. 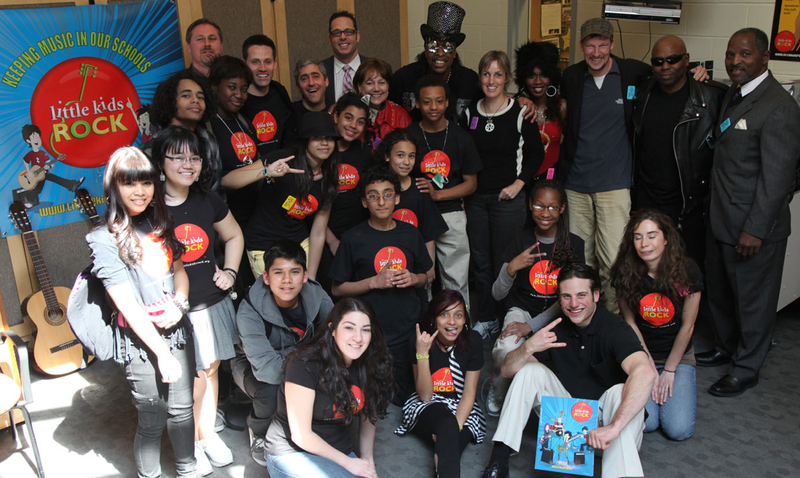 Rock and Roll Hall of Fame funk superstar, Bootsy Collins (Parliament-Funkadelic and James Brown) and hip hop legend Brian Hardgroove (Public Enemy) walked into a classroom full of smiling faces, tuned-up instruments, and the future rockstars who play them! Bootsy whipped out his illustrious space bass and showed the class a few things. Hardgroove grabbed a bass and joined the student band, who laid down a blues groove. Little Kids Rock founder Dave Wish grabbed the mic and free-styled a bit before handing it off to Bootsy, who really got things going. Everyone sang the blues, including the kids and some of the special guests who attended the visit: JCPS Superintendent Dr. Charles T. Epps, Jr., Former UNICEF Executive Director and Secretary of Agriculture Ann Veneman, Braille Without Borders founders Sabriye Tenberken and Paul Kronenberg, and photographer/human rights activist Rick Guidotti. Bootsy and his wife Patti Collins run the Bootsy Collins Foundation whose motto is, “Say it loud… an instrument for every child!” In spirit of this, Bootsy brought with him an electric bass guitar to donate. Bootsy and Hardgroove are both honorary Little Kids Rock board members devoted to helping the charity restore and revitalize music education in public schools nationwide. And maybe add a little funk too!